Most important: that you feel comfortable, no matter what any bike fit says! ▸ Do changes gradually and test them on several, also longer rides. It can take some time until problems become apparent. Listen to your body. These contact points are joined up by body parts of differing length (there is no such thing as a standard human being!) and their joints: lower leg, knee, upper leg, hips, upper body/back, shoulders, upper arm, elbow, lower arm. Bike fitting is about adjusting the geometry of your bike to your very specific body geometry, so that the muscles and joints can work at their ideal angles to prevent pain and injury and the muscles can work most efficient to make your rides maximum enjoyable! Only judge when sitting in final riding position! Note: your legs might not be used to this much stretching, leading to your hip to rotate. In that case raise the saddle in small amounts over several rides up to the appropriate height. When your pedal is at the 10-11 o’clock position, your knee should be at an angle of 90 degrees. If it’s smaller but your saddle height is okay, then your cranks are too long. If it’s larger, then the cranks are too short. If your cranks are too long and you cannot change them easily, adjust your saddle height so your knee angle in the 10-11 o’clock position is 90 degrees. This will lead your hip to rotate slightly, but this is preferable to the knee being bent too much. Again: sit in final riding position! Ride a bit to determine which that is. 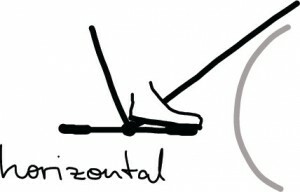 Note: this adjustment can have an effect on your optimum saddle height (and vice versa), because everything is joined up! A bike fit therefore is an iterative process. The handlebar position depends on the type of riding you want to do (e.g. touring or racing) and on the strength of your back muscles. You should be able to hold your back in the riding position for some time without your hands touching anything. Your back should be in its natural S-shaped form, otherwise you’ll get pains in your back, neck, shoulders and/or hands. The angle between your upper body and your upper arm should be 90 degrees and your elbows should be slightly bent. If the angle is larger, you will feel stretched, you’ll tend to move backwards with your hands, e.g. on drop handlebars. If the angle is too small, your body automatically tries to adjust it by bending your back and rotating your pelvis, leaving the S-shaped form. If you prefer to sit very upright because your back muscles are not so strong, don’t be tempted to raise your handlebars up too high. They should not be more than 10 cm above the saddle! If you prefer a leisurely upright position, then go for the “Dutch bike position” where the handlebar is quite low but closer to your body and the hands loosely rest on the handlebar (no 90 degree angle between body and arms in this case, of course). In this position, the back should be held in it’s natural S-shaped form, freely balancing.